Hello everyone! I know it's been a while since I've posted, but life has been crazy busy. No matter how many times I talk about my hair you guys keep asking about it. So today I will talk about some of my favorite hair and skincare products I'm presently using. Blue Chamomile & Argan Oil Care Collection is absolutely amazing! The line features a shampoo, conditioner and deep conditioning treatment to brighten and repair all shades of blonde hair. Known for its nourishing benefits, the deep blue violet coloring of the formula works to neutralize unwanted yellow and orange tones, aiding in the reduction of brassiness. 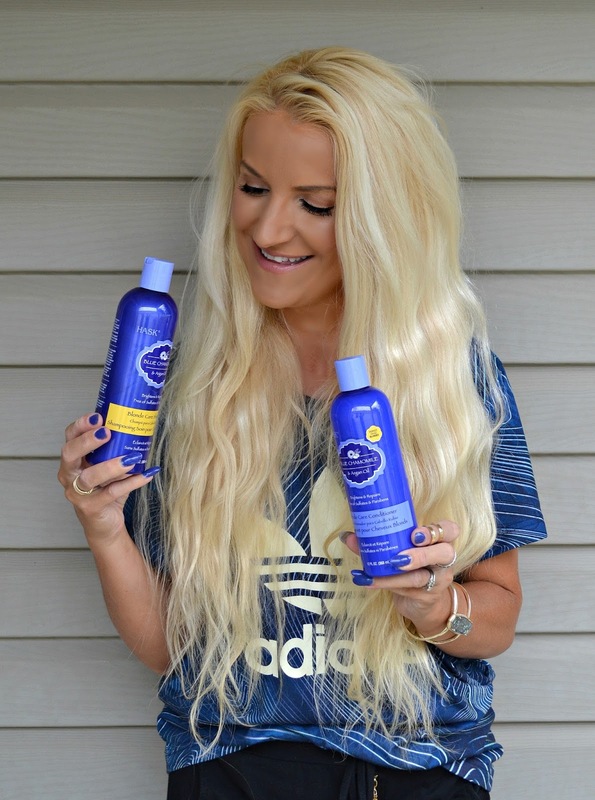 My hair gets dry easily and this particular Hask product has been infused with argan oil to provide the extra moisture that any blonde hair craves. This shampoo really smells like chamomile and flowers. You would love it! Julep is the skincare product I have been using for about 5 weeks. If you haven't hear of Julep then I would highly recommend checking them out! I've received a full facial cleansing set including cleansing stick, cleansing oil and charcoal sponge. This essential cleansing trio is key to the first step in any well-rounded Korean skincare routine. 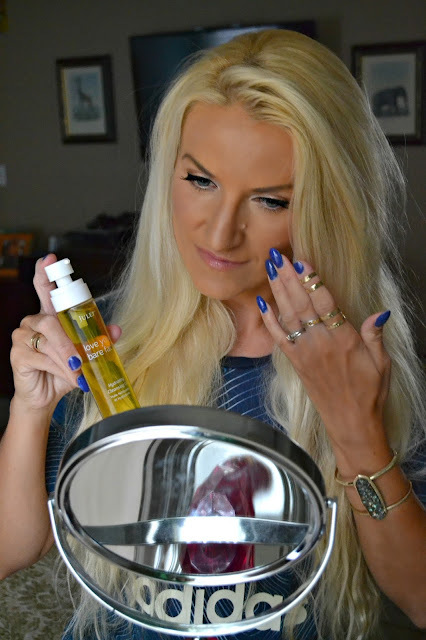 Hydrating Cleansing Oil remove all makeup and surface impuritie. This antioxidant-rich oil cleanser melts away every trace of makeup, sunscreen, and surface impurities as it nourishes the skin. It rinses clean without leaving any greasy residue. Perfect for all skin types. Cleansing stick lifts away all remaining dirt, sebum, and impurities while gently exfoliating with natural fruit enzymes. Charcoal sponge is all natural made from the fibrous root of the Konjac plant, it sloughs away dull, dead skin cells—revealing the fresher, smoother skin beneath. 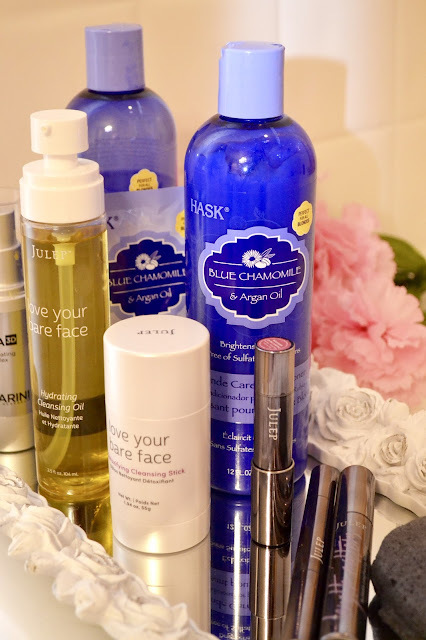 I'm in love with all of these products and hope you will too! Shop these products by clicking the names or widget pictures below. *I received the products from Julep as part of the #PreenMeVIP program. Opinions are honest and mine!